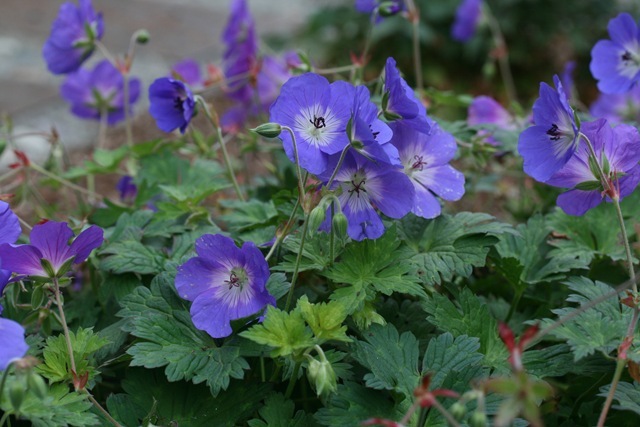 I am a huge fan of Geranium ‘Rozanne’. Here’s a plant that’s gotten tons of press in the last few years (tons of press for a plant at least! ), winning all kinds of plant-y awards and generally being the plant world’s Paris Hilton. Except ‘Rozanne’? She actually deserves the attention. She blooms gorgeously from her first few stalks in spring, keeping it going with increasing intensity until the nights get really cold in winter. Even in December, she’s still putting out new foliage and blossoms around the masses of old foliage left! ‘Rozanne’ gets on famously with any number of plants – she can hide the gawky bases of roses, or you make the most of her white flower center by partnering her with the white-flowered Philadelphus x ‘Snowbelle’. You can also highlight the blue by contrasting it with bright golden foliage like Golden Sweet Flag Grass, an evergreen favorite of mine. In the fall, a little touchup keeps your ‘Rozanne’ fresh until winter dormancy takes over. Filed Under: How to Prune Tagged With: Fall, Pruning, Videos, What to Plant? Are they getting enough sunshine and water, Kim? Either problem would account for legginess. Or if they’re new, that would account for it too – give them a full year to settle into a finer habit. Until then, yes, head back each leggy stem by 1/3 or half, cutting to a point where there’s a leaf or side shoot. If you need to, don’t be shy about removing some stems entirely by cutting them out at the base of the plant. Rozanne’s not going to be offended by too much pruning, it’s just a matter of doing so in a way that doesn’t make her look terrible after, so don’t just take the shears to her – prune her with your hand pruners. But she’ll recover quickly from pruning as long as you prune to a side shoot or leaf and don’t just leave bare stems sticking up. You get get a lot of legginess taken care of this way and encourage a bushier habit for the rest of the year. 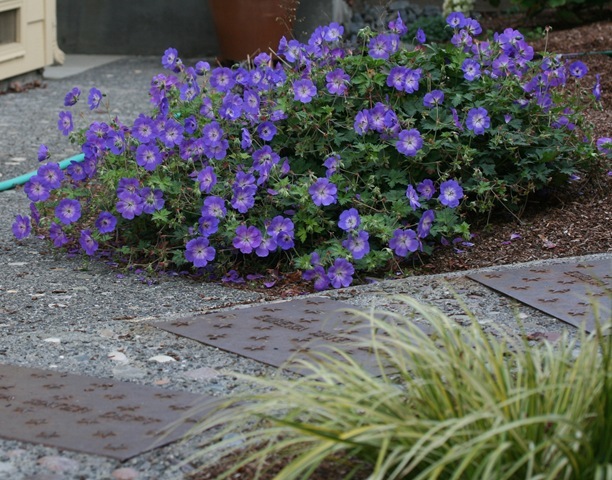 If your plants are 2′ around, then they would only be about 8 inches across. One of my customers has “rozannes” across the front of their house … beautiful ! It’s near winter now .. do I trim them off at ground level or leave some stems showing ? John, the plants should “show” you what to do. Do they have a tuft of beautiful fresh growth that you can cut back to? Or is the whole thing looking crappy? Let the plants’ growth decide your course of action. At some point in winter they do usually die back fully and I do cut them at ground level. Thanks ! The growth this year was extremely full and spreading everywhere .. climbing fences .. spreading to other plantings .. out of control … but IMO really beautiful. I’ll trim them back to ground level after they die off (I forgot to mention the home is near Rochester, NY. so winters are quite extreme) .. Please-another quick question: Can I take cuttings for transplant or dig into the root and not hurt the plant ? Hi John, I am pretty sure you can divide hardy cranesbills easily once they’re well-established. I am not sure of the legality of doing so with Rozanne, as it is still under patent. You might look into the laws about that – maybe you can propagate them for your own home use but not sell them? I’m not sure. Hello! I’ve been reading the conversation(s) about Rozanne (so beautiful eh?). I have my first year Rozanne in a large pot and she has done super well. My question is, can she stay in the pot in the yard all winter (Michigan zone 5), or should I move the pot to the garage? Or, can I dig her up and store her in the garage or basement? Please advise… Thanks! Brenda, I think she’s only hardy to zone 5 (not sure – I garden in zone 9?) so if that’s the case, definitely take her inside if she’s in a pot. A pot doesn’t protect the roots from cold very well. Question . I live in Winnipeg Canada , i believe a zone 3b. 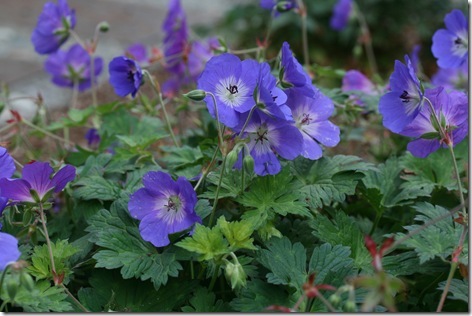 I planted the geranium rozanne and it looked beautiful into the late summer. However I forgot to prune it at the end of the season. Should I prune it back now ? or wait till it has growth. tag from these plants and it said “plants can be sheared to 3” to rejuvenate. Rarely needs division. What should I do? My Geranium Roseanne is already very leggy and sloppy, and it’s only June 2. There are no flowers yet, just a few early buds. Should I prune now (back to first leaf) or wait until they bloom? Janet – is your Rozanne getting enough light? It should not be flopping before flowering, so I am thinking it very, very likely it’s in far too much shade. The only other thing I can think is if it has two problems at once – it has been in the same spot for many years and may need dividing, and also is not getting enough water. You can diagnose the issue better than I can. Pruning won’t solve either problem. Good luck! That demonstration was so clear! I’m somewhat behind on a couple of Cranesbills, but will get to them ASAP. I planted my rozanne geraniums last summer, I think I bought 6 of them, they started to bloom shortly thereafter and already spread quite a bit. This year, as of now, they’ve grown and spread so much, lots of blooms, really beautiful. However, they’ve grown so tall (over 3 feet tall) and messy I wonder if I can prune them down, and wether I should do it now or wait till the Fall? please let me know if it’s too late to prune back cranesbill? I have a number of Rozann Geranium. They have not bloomed and it is. June 3. I am in zone 6. We had a very hard winter could that be the cause . Or is it too early for them to be blooming, they look big and healthy but no flowers. They did well the previous two years. I’m having the same issue. I’m in lower Michigan (zone 6) and my plants are full and beautifully mounded but nary a bloom to be seen! I will acknowledge we had an atrocious winter and my lilacs didn’t bloom. My peonies are very happy, though! I’m hopeful I’m just impatient and Rozanne will show her colors shortly. Same here and I am in zone 5a or 5b. Beautifully mounded but why are they not blooming this year? Any suggestions? I’m in zone 6. 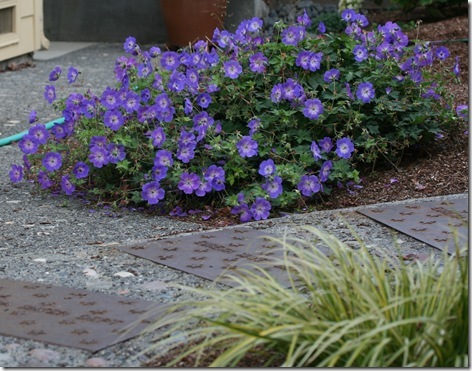 Can I plant Roxanne geranium in a south and southwest location with direct hot sun? I bought 7×2 litre pots of Rosanne hardy Geraniums in April I am very pleased with the results,the plants are giving me a mass of flowers.Being as this is the first season do I prune these in the fall. Great video and thanks for sharing. I love Hardy Geranium Rozanne. I have many of them and they are low maintenance and flowering beautifully all summer and fall in my sunny gardens. I loved the added bonus of the cat running across in the background. So cute. Thanks for sharing.